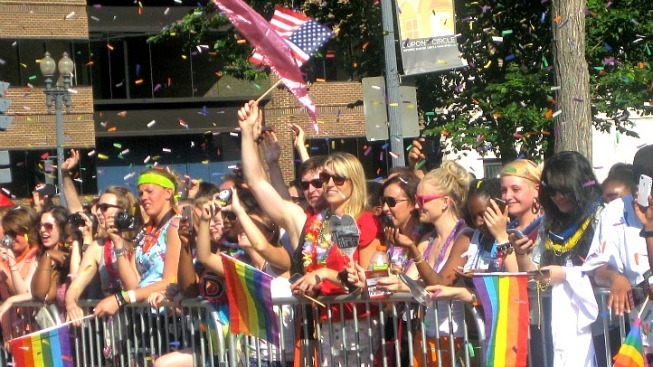 People cheering at the 2012 Capital Pride Parade. A colorful celebration of unity and spirit never looked so good this weekend. D.C.’s LGBTA community holds its 38th Annual Capital Pride Parade Saturday, stepping off at 4:30 p.m. from 22nd and P streets NW and should continue to 7:15 p.m. 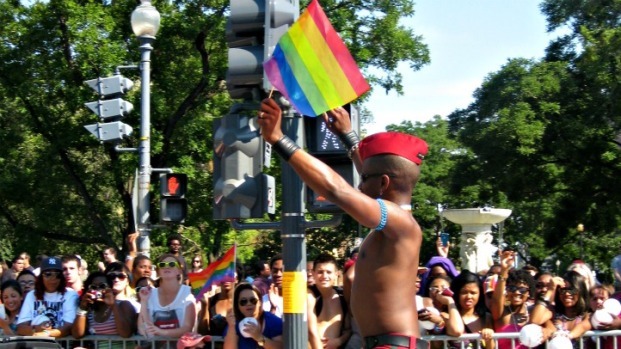 Repeatedly voted D.C.’s Best Parade in the Washington City Paper readers' poll, the Capital Pride Parade features more than 170 floats, street performers, walkers in extravagant (and sometimes scanty) attire, and drag queens. More than 50 events will take place highlighting the diversity in the gay, lesbian, bisexual and transgender communities in the District. Entertainment begins at 3:30 p.m. and the parade starts at 4:30 p.m. and will wrap up around 7:30 p.m. This year’s Pride Parade award theme is superheroes. Other awards are up for grabs, such as the Tina Turner Award for Best Decorated Float, the Village People Award for Best Small Group and the Elizabeth Taylor Award for the Best Non-Profit. Former Miss World USA 1973 Lynda Carter will serve as super grand marshal of this year’s parade. Carter is also known in her role as lead actress in the original “Wonder Woman” series. For a more family friendly setting, head over to the 17thAnnual Capital Pride Festival Sunday. More than 150,000 visitors will join hundreds of national and local performers, politicians and activists at the Capital Stage. Between 3rd and 7th streets NW on Pennsylvania Avenue, the festival will feature numerous food tastings, an art showcase featuring LGBTA artisans, a family area with face painters and a water slide, and information sessions from local groups. Cher Lloyd, Icona Pop and Emeli Sande are just a few of the headliners who will be performing in beverage gardens, where festival goers can enjoy their favorite cocktails. Donations will be accepted at the entrance of the festival.